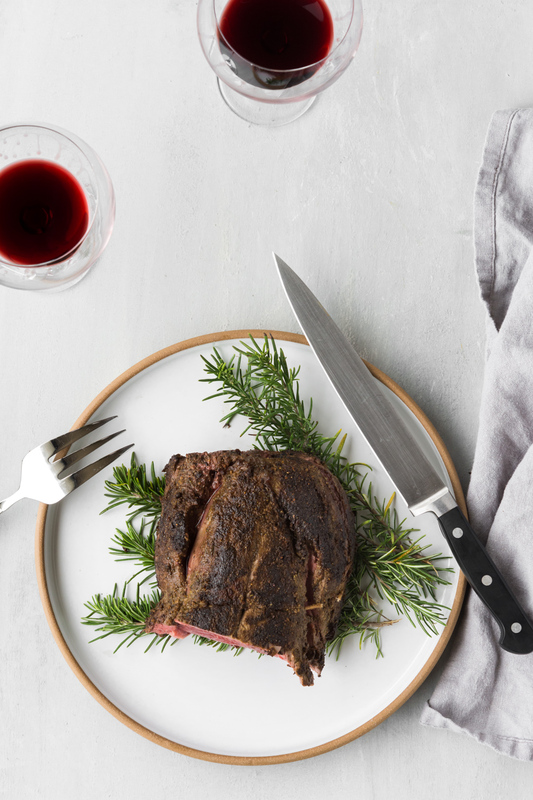 For us, beef tenderloin is the ultimate holiday roast. My mom made it every year for Christmas dinner, marinated with fresh rosemary, black pepper and thin slivers of garlic, and then roasted to a tender medium rare. While that is my go-to tenderloin technique, I always love to find new methods and flavors for the holiday classics. The beef tenderloin I’m sharing today is coated with a powder of dried porcini mushrooms, rosemary and black pepper, seared in a pan and finished in the oven. The crust is incredibly savory and the earthiness of the mushrooms and rosemary complement both the beef and the holiday spread. The original authors of the tenderloin suggest a port wine sauce, though I went rogue and developed a sauce with a dry red wine to avoid the sweetness from port. I used Julia Child's brown sauce recipe as a quick alternative to a demi-glace, and then essentially made a bordelaise sauce sans bone marrow. It's rich, elegant and deeply flavored, yet it doesn't take days of roasting and simmering (or obscure ingredients!). The brown sauce can be made well in advance and frozen, and the red wine sauce can be made while the tenderloin is roasting. Best of all, the sauce is delicious with any red meat (we had some with flank steak one night), so don't limit it to just the holidays and expensive cuts! Red wine, beef and mushrooms are the ultimate flavor trifecta and this sauce seals the deal. I strongly recommend searing the meat in a cast iron pan. Occasionally, the coating can stick and pull off in a stainless steel pan, which is extremely frustrating when such an expensive piece of meat is involved, but the cast iron never fails! the recipe authors grind the mushroom and rosemary mixture to a coarse powder, however, I prefer grinding all the way to a more uniform, fine powder. Grind to whichever texture you prefer! the brown sauce can be made up to a week in advance (or more, and frozen until needed), and red wine sauce can be made a day or two ahead if necessary. Cook the vegetables and ham or bacon slowly in the butter or oil for 10 minutes. 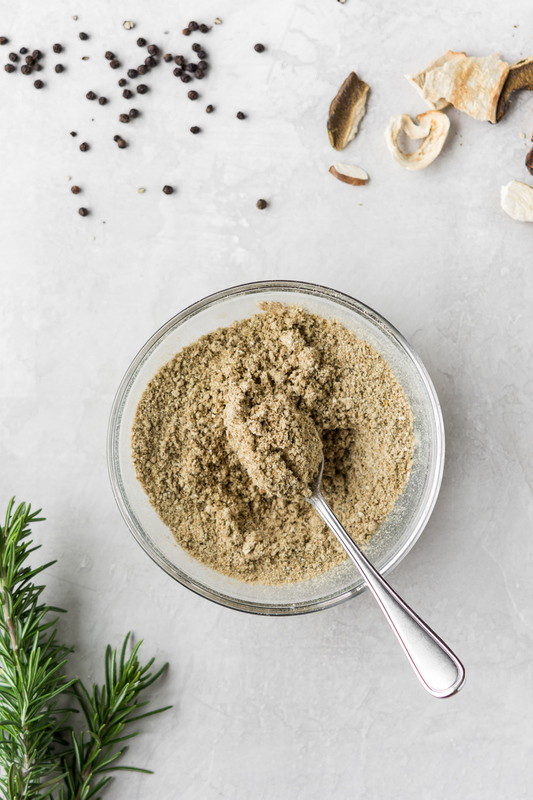 Blend the flour into the vegetables and stir continually over moderately low heat for 8 to 10 minutes, until the flour slowly turns a golden, nut brown. Remove from heat. With a wire whisk, immediately blend in all of the boiling liquid at once. Beat in the tomato paste. Add the herb bouquet. Simmer slowly, partially covered, for 2 hours or more, skimming off fat and scum as necessary. Add more liquid if the sauce thickens too much. You should end up with about 4 cups of sauce, thick enough to coat a spoon lightly. Correct the seasoning. Strain, pressing juice out of vegetables. Degrease thoroughly and proceed to wine sauce. Alternatively, transfer to a container, cover with a piece of plastic wrap to prevent a skin from forming, cool and refrigerate or freeze. Brown sauce will keep for up to 1 week refrigerated or up to 6 months frozen. Season the tenderloin all over with salt. Refrigerate 4 hours or up to 24 hours. Thirty minutes before roasting remove beef from refrigerator. Heat 1 tbsp olive oil in a wide skillet over medium-high heat until shimmering. Add beef and brown on all sides, about 8 minutes. Transfer to a roasting pan. Roast in oven until thermometer inserted in thickest part reads 125 F., about 30 minutes, for medium rare. Remove from oven and transfer to a cutting board. Tent with foil and let stand for 15 minutes. Carve beef in 1/4 inch slices. Serve with red wine sauce (below). Cook butter and shallot in a small saucepan over medium-high heat until shallot is soft and translucent, but not burnt, 5- 7 minutes. Add red wine and simmer until almost all of the liquid is cooked off and only a few tablespoons remain. Add the brown sauce, stir to combine, and simmer until the sauce has thickened and the flavors are married, 8 to 10 minutes. Taste, season with salt and freshly ground pepper if needed, remove from heat and set aside until beef is ready. Sauce can be gently reheated on the stove or in short intervals in the microwave (stirring in between) when needed.